RowShare Business: only available if you have subscribed to RowShare Business. RowShare tables can be moved and/or copied around by clicking on the Copy/Move icon. You first have to chose where you want to move or copy it, either in your personal tables or within a RowShare Business space. Copy the table: A new copy will be created with the exact same content and settings. Only content and settings you have access to is kept. If you own the table or if the row owners email is displayed, the rows in the new table will have the same owners. If it’s not the case, you have no way to know who owns each row, so all the rows in the new table will be assigned to you. Create an empty table with the same columns: An empty table is created. Its settings and columns are the same, but it start with zero rows. 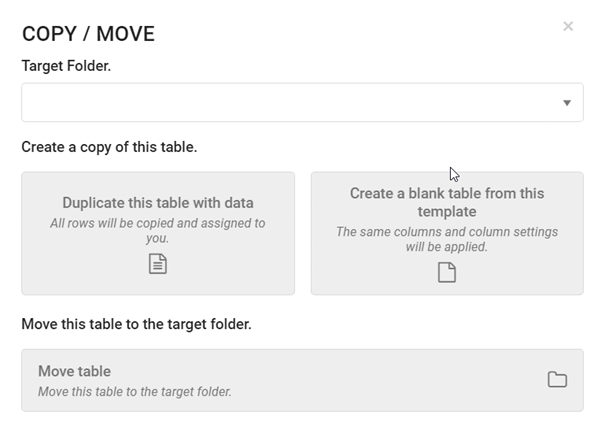 Move table: your current table is moved to another folder, in your Personal Tables or in RowShare Business. Has someone recently shared a table with you and you'd like to be able to find again it easily? The solution is to add it to your favorites. To do so, just click on the star icon to the right of the table's name. Click again to remove it form your favorites. This table is instantly added to your favorites, located in the My RowShare page. RowShare Business users have access to a private workspace. As opposed to My Personal Tables, all members of a given RowShare Business team can browse the same folders, share tables, in a secured an private area. Recycle bin: it stores all deleted tables. Only RowShare Business administrators can see it and restore its content. Administrators can define the security level, allowing or forbidding to share tables outside the RowShare Business team. Learn more about RowShare Business. What is my RowShare login? Where does RowShare store my data?